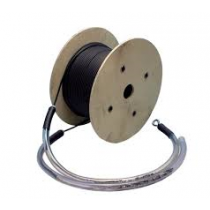 The Steel Wire Armoured (SWA) loose tube cable is the most ruggedized pre terminated fibre cable option for crush and rodent protection making it ideal for direct burial. The Pre-Terminated pre term is manufactured with a gland on each end which is epoxy bonded onto the Kevlar Strain Relief Yarn in the cable. The secondary coated fibres are terminated with either ST, SC or LC connectors which are fully tested and test results are send with the cable. A specially developed termination protection sleeve is fitted to each end of the cable assembly to protect the connectors during shipping and installation. This sleeve has a small diameter and is flexible, lightweight and extremely rugged. The protection sleeve connects onto the epoxy bonded cable gland and can withstand the high tensile loads applied when pulling cables through ducts. A pulling eye is incorporated to allow the attachment of a draw cable. After cable installation, the protection sleeves are removed and the connectors are threaded through the gland hole of any cable management enclosure. A gland nut is used to secure the cable gland in place.